Car shopping and happiness have one thing in common: Lake City Chrysler Dodge Jeep RAM (CDJR). When you shop with us, we have a staff of professionals who are dedicated to making sure you leave our dealership satisfied. If you’re in the market for a new vehicle, our inventory is stocked with a wide variety of different makes and models of both the new and used variety. We offer several products and services in our Parts and Service department, and our finance team takes the stress out of the buying process. The gateway to happiness lies at 4325 West Highway 90, Lake City, FL 32055. When you purchase with us, you’re guaranteed 2 free oil changes and a 3-Day Satisfaction Guarantee as part of our Gateway to Savings program. Feel free to call browse our website or call us at (833) 819-8812 today to learn more. Why limit your choices to just one make when you can shop at a location that offers four? 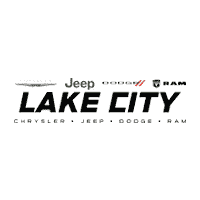 At Lake City Chrysler Dodge Jeep RAM, you can choose the vehicle that works best for you. We are fully stocked with a wealth of new vehicles of several different varieties. Drivers seeking a work truck companion can check our inventory of new RAM trucks. Are you in love with performance vehicles? The Dodge Charger and Challenger models are calling your name. Our vehicles are stacked with advanced technology features like responsive infotainment systems, elite safety systems and more. To experience for yourself, Live Oak, FL drivers can feel free to come test-drive a new model at Lake City Chrysler Dodge Jeep RAM today. If you’re looking for a previously loved vehicle, we have a vast selection of high-quality used vehicles on our lot. We have vehicles ranging from luxury vehicles to family-centric SUV models, and they all come at an affordable price. When you select a pre-owned vehicle, you still receive the benefits of our Gateway to Savings program that allows you to exchange your vehicle within 3 days as well as the gift of 2 free oil changes with your purchase. Lake City, FL drivers also have the option to shop Certified Pre-Owned. When you purchase a Certified Pre-Owned vehicle from us, you can be sure of its quality because of our rigorous 125-point inspection. Additionally, you receive benefits including a 3-month/3,000-mile Limited Warranty, an 84-month/100,000-mile Powertrain Limited Warranty and Roadside Assistance. When you do business with us, you’re getting the best. While you’re on our website, feel free to check out our pre-owned specials. Take a look at our used and Certified Pre-Owned inventory online or call us at (833) 821-4014 to get started today. Don’t let the auto finance part of car shopping deter you from visiting us. Our finance experts at the Lake City CDJR finance center are trained to take all the hassle out of the finance process. Our staff is ready to help you get an auto loan with low interest rates and great financing deals as soon as you walk through our doors. Get the best finance offers when you work toward a purchase deal with us. Car buying has never been this easy. Use our website to start the process, and we’ll be happy to finish it by getting you in a new car when you visit us in Lake City, FL. There’s no better place to seek routine maintenance like oil change service or tire rotations than at the Lake City Chrysler Dodge Jeep RAM service department. Our expert mechanics can take care of the day-to-day routine repairs, and they’re just as qualified to tackle the larger repairs, should something happen to your vehicle. If you’re looking for motor oil to do the job yourself, take a look at our parts and accessories inventory. You can use our website to order parts for yourself, and then your inner mechanic will take care of the rest. No matter what you’re looking for, we’ll help you find it. Auto repair is easy when you work with us at Lake City Chrysler Dodge Jeep RAM. Take advantage of our website to get the jump on special offers so you can save even more. No matter when you come in, we’ll make sure that you leave in the vehicle you’re looking for and with a smile on your face. Lake City, Gainesville and Live Oak, FL drivers can visit us at 4325 West Highway 90, Lake City, FL 32055. Stop by today!